This accessory pack makes any DynaMount even more versatile. The Onstage Posi-Lok Clutch and Latch Lake Jam Nut can be used to mount a DynaMount vertically, at an angle or even inverted. The LyxPro 1.5ft right angle cable and Latch Lake thread extender are especially useful on X models as they give extra clearance when needed. This is particularly helpful when using mics that have the XLR connection on the bottom. This handy attachment allows you to mount your DynaMount vertically or on an incline without drooping. Some microphones have the mic cable outlet on the bottom (e.g. AKG C414 and Neumann U87). This right-angle XLR adapter cable makes it easier to use these mics by reducing the clearance needed. Gives you a couple inches of extra clearance for the microphone and cable. 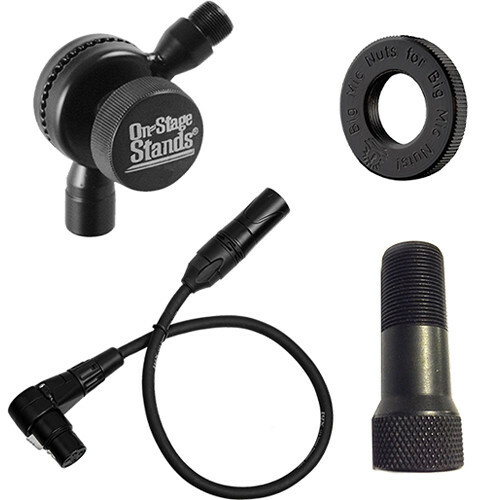 Lock the DynaMount (or attached microphone) onto the mic stand at the desired position. Box Dimensions (LxWxH) 5.4 x 4.9 x 1.7"